Campaigners warned on August 27 that reports that 2380 people died within months of being branded “fit for work” under the British government's new welfare laws grossly underestimate the true impact of invasive government assessments into the lives of severely ill and disabled people. More than 50,000 people on Employment Support Allowance (ESA) passed away within a year of undergoing work capability assessments (WCAs) between May 2010 and February 2014, according to new figures were released on August 26. Campaigners say the procedures, which have been criticised for causing high levels of stress and wrongly dumping thousands onto jobseeker’s allowance, have almost certainly contributed to that total. The Department of Work and Pensions (DWP) has claimed that it does not hold any information on the reasons for death, so “no causal effect” with changes in claimants’ benefits and mortality can be assumed from their statistics. 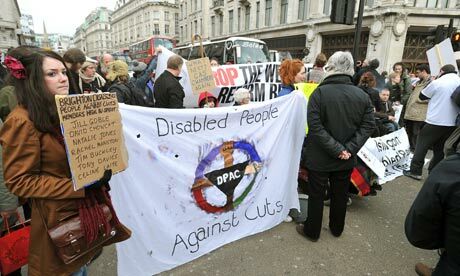 She said: “We see the ‘causal effects’ of these inhuman DWP policies on disabled people every day, and emails sent to Dpac show that the effects are very real. Labour leadership candidate Jeremy Corbyn voted against the Welfare Reform Act 2007, which introduced the WCA, and has campaigned alongside disabled people to scrap it. He said: “It is clear that the work capability assessment has failed to adequately assess support needs, and has caused immense distress and suffering for thousands of disabled claimants. Green Party work and pensions spokesperson Jonathan Bartley also called for the abolition of WCAs. Work and Pensions Secretary Iain Duncan Smith demanded that MPs “stop lecturing” him to reveal the number of deaths after the DWP was flooded with Freedom of Information requests. But Labour shadow minister for work and pensions Kate Green slapped him down, noting that ministers have been “trying to suppress these statistics for more than three years”. The department even went so far as to appeal a ruling by the Information Commissioner that it was acting unreasonably in refusing to release the information, she added. Green said: “The delay and the lack of transparency in publishing this information is a disgrace and has caused huge distress to the families and friends of those affected.